Olsen Law Firm, P. A. If you are suffering due to someone else’s negligence then please call now to schedule a FREE CONFIDENTIAL meeting with Pam Olsen, Attorney and Counselor At Law. Available 24/7 in your home, hospital, or our office. 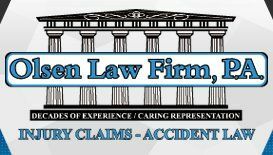 Pam Olsen has cemented her reputation by devoting herself to helping personal injury victims in the following case types: car accidents, truck accident, motorcycle accident, boat accidents, slip and fall, dog bite, wrongful death, medical malpractice, elder abuse, work injury, social security disability, and more. Attorney Pam Olsen truly cares about your well-being her local Ocala community. Don’t be just a number to the larger firms. We are large enough to battle with the large companies but small enough to know you by name. Bundza & Rodriguez, P. A.